As President Juncker emphasised in his 2017 State of the Union address ‘Europe is more than just a single market. More than money, more than the euro. It was always about values.’ 1 As stated in Article 2 of the Treaty on European Union, ‘The Union is founded on the values of respect for human dignity, freedom, democracy, equality, the rule of law and respect for human rights, including the rights of persons belonging to minorities. These values are common to the Member States in a society in which pluralism, non-discrimination, tolerance, justice, solidarity and equality between men and women prevail’. The Preamble to the Treaty refers to the cultural, religious and humanist inheritance of Europe which has inspired these values. The common values have been fundamental in forming a Union that has bound countries, communities and people together in a unique political project, enabling Europe's longest ever period of peace. This has spanned overcoming Europe's deepest divisions immediately after World War Two to the peaceful transition to democracy in countries of Central and Eastern Europe after 1989. A peaceful, social and democratic Union is built on these values, which are not only valid within Europe, but are those that represent the Union in the world. By global standards, European societies are prosperous and affluent places to live. They have the highest levels of social protection in the world and rank highly in terms of wellbeing, human development and quality of life. Yet, although the Union is experiencing strong growth and unemployment is at its lowest level since 2009, when asked about the future, many express anxiety and concern, in particular for future generations, in a context of growing threats and uncertainties both at home and abroad, increasing inequalities, a resurgence of racism and xenophobia and the viral spreading of misinformation and fake news. High quality education, enhanced through mobility, transnational cooperation and structural reforms, is critical in reducing inequalities; fostering inclusive, stable and democratic societies; and making a success of migration and globalisation, all of which can help combat the risk that social challenges .threaten our ability to maintain open, equal and cohesive societies. Building common values into all learning environments can help mitigate intolerance, polarisation and divisive nationalism. Education is central, therefore, in safeguarding the foundations of our societies. It supports social cohesion, enhances the emergence of a common sense of belonging — be it at local or national level and strengthens people’s confidence in public institutions and in our democratic systems. This is particularly true for the European Union. A widespread lack of awareness of its origins, its basic functioning and its raison d’être favour misinformation and prevent the formation of informed opinion on its actions and evolutions. Moreover, Europeans know little about the social, religious and cultural diversity, heritage and the political realities of their own countries and those of other Member States. This prevents both a deeper understanding of their respective realities as well as the emergence of a collective sense of belonging across Member States. The promotion of the common values embedded in Article 2 of the Treaty of the European Union is vital to reverse those trends. Education, at all levels, be it formal, informal or non-formal, is essential in ensuring social mobility and inclusive education, inculcating common values and in building a common sense of belonging at European level. Concrete steps have already been taken in that direction. On 17 March 2015, Member States’ education ministers called for actions at all levels of government to reinforce the role of education in promoting citizenship and the common values of freedom, tolerance and non-discrimination, strengthening social cohesion and helping young people become responsible, open-minded and active members of our diverse and inclusive societies 2 . More recently, the Commission recalled in its reflection paper on globalisation that ‘equal access to high-quality education and training is a powerful way of redistributing wealth in a society. This should start with a high standard of basic education and access at all ages to training and skills’ 3 . Finally, ahead of the Social Summit held in Gothenburg, the Commission published its Communication on ‘ Strengthening European Identity through Education and Culture 4 . The text stresses that ‘it is in the shared interest of all Member States to harness the full potential of education and culture as drivers for jobs, social fairness, active citizenship as well as a means to experience European identity in all its diversity. Against this background, this Recommendation seeks to create the conditions for a greater commitment of Member States and render their education systems more resilient, inclusive, and values based. The Recommendation is built on three main objectives: promoting common values at all levels of education, fostering more inclusive education as well as encouraging a European dimension of teaching. To achieve those aims, the Commission will take steps to increase virtual exchanges among schools, notably through the e-Twinning network and boost school mobility under the Erasmus+ programme. The European Structural and Investment funds can be availed of to support teacher training or fund physical infrastructure that enables inclusive education. One of the objectives of the ET2020 framework for European cooperation in education and training, namely to promote equity, social cohesion and active citizenship, has been established on the basis that education should promote intercultural competences, democratic values and respect for fundamental rights, combat all forms of discrimination, and equip young people to interact positively with their peers from diverse backgrounds. ET 2020 was updated in 2015. The 2015 Joint Report of the Council and the Commission on the implementation of the strategic framework for European cooperation in education and training (ET2020) states that ‘Education and training have an important role in ensuring that the human and civic values we share are safeguarded and passed on to future generations, to promote freedom of thought and expression, social inclusion and respect for others, as well as to prevent and tackle discrimination in all its forms …’ and, furthermore, proposed ‘inclusive education, equality, equity, non-discrimination and the promotion of civic competences’ as a new priority area for European cooperation in education and training. In this context an ET 2020 Working Group on Promoting citizenship and the common values of freedom, tolerance and non-discrimination through education was established. Recommendation 2006/962/EC of the European Parliament and of the Council of 18 December 2006 on key competences for lifelong learning identifies the knowledge, skills and attitudes for personal fulfilment, active citizenship, social cohesion and employability. Critical thinking, sense of responsibility, conflict resolution are identified as concepts transversally underlying all other competences. In the 'Communication on Improving and Modernising Education’ adopted on 7 December 2016 and subsequently the youth initiative adopted on 30 May 2017, the Commission set out its strategy for high quality, inclusive and future-oriented education with specific measures including School Development and Excellent Teaching for a Great Start in Life, 5 a Renewed EU Agenda for Higher Education 6 and a proposal for a Council Recommendation on graduate tracking. 7 Along these lines, the Communication proposed actions related to inclusive education and the promotion of common values including the continued professional development of teachers, the further development of the European Toolkit for Schools as well as the use of Erasmus+ and Horizon 2020 funds to promote good practice in the area of inclusive learning (e.g. integration of migrant pupils and imparting common values). The European Structural and Investment Funds also help to promote inclusive education, by supporting projects targeting education systems, teachers and schoolchildren. They finance initiatives to ensure young people complete their education and get the skills that make them more competitive on the jobs market. Reducing school drop-out rates is a major priority, along with improving vocational and tertiary education opportunities. In the 2014-2020 period more than EUR 39 billion are allocated to achieving that objective. A number of initiatives at EU level are already in place, which highlight the need to support promotion of common values, to support integration and social cohesion. The European Agenda on Migration develops President Juncker’s Political Guidelines into a set of mutually coherent and reinforcing initiatives, based around four pillars, to manage migration better in all its aspects. The European Agenda on Security guides the Commission’s work in this area, setting out the main actions to ensure an effective EU response to terrorism and security threats in the European Union. Preventing and fighting radicalisation is one dimension of this agenda, where education has an essential role. As part of that agenda, the Radicalisation Awareness Network is an umbrella network connecting people involved in preventing radicalisation and violent extremism throughout Europe that has a specific Working Group on education . The Commission 2016 Communication on Supporting the prevention of radicalisation leading to violent extremism' put forth key areas whereby the EU can help support Member States in preventing and countering violent radicalisation leading to terrorism. This Communication proposes the need to ‘promote inclusive education and EU common values’ through specific measures including announcing this Council Recommendation, mobilising Erasmus+ funding, establishing a network of positive role models and awarding student credits for volunteering. In July 2017, the European Commission set up a High Level Group on Radicalisation 9 to step up efforts to prevent and counter radicalisation, including through educational policies and to improve coordination and cooperation between all relevant stakeholders building on achievements so far. In November 2017, the High Level Group issued an interim report with preliminary findings and a set of first practical recommendations in different areas. As regards education, the High Level Group has mainly recommended to instigate the use of opportunities offered by existing platforms (such as eTwinning) to promote fundamental values, democracy and citizenship and help develop critical thinking, as well as to develop the awareness of teachers and their ability to work in the best possible way within the school if there are signs of radicalisation. Other EU initiatives are referred to in the ‘state of play’ sections in chapter 4. Terrorism and social issues are a prominent concern of EU citizens. In the 2017 Standard Eurobarometer, 10 terrorism is on top of the issues that citizens cite when it comes to challenges that the EU is currently facing, and the number one concern for the EU in 21 Member States while this was the case in one country only in autumn 2016. In the 2016 Eurobarometer report on ‘Future of Europe’, more than one third of respondents considered social inequalities to be the main challenge for the EU, alongside migration issues (both 36 %). 11 When asked to identify up to two areas they thought should be emphasised by society in order to face major global challenges, almost half (46 %) of respondents mention social equality and solidarity. A majority of respondents in 21 Member States think social equality and solidarity should be emphasised in order to face major global challenges. EU citizens are also very much attached to the EU values as defined in Article 2. The EU’s respect for human dignity, freedom, democracy, equality, the rule of law and respect for human rights, including the rights of persons belonging to minorities are seen as its main assets. Peace, freedom of opinion, social equality and solidarity, and tolerance and openness to others are the values considered to be best embodied by the European Union. Almost six in ten respondents say the EU best embodies peace and freedom of opinion (both 57 %), while 55 % say this about social equality and solidarity and 52 % about tolerance and openness to others. However, since 2012, there has been a decline across the EU in those who think the EU best embodies these values. 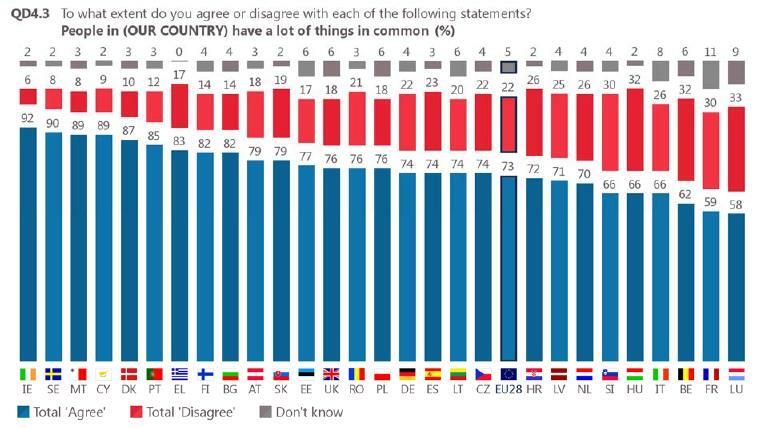 Furthermore, more than half of Europeans (52 %) feel that their voice does not count in the EU. This is also reflected in participation in European Parliament elections, with a voter turnout of 43 % at the 2014 elections, and only 28 % of people aged between 18 and 24. When looking in details, the evidence shows that common values are not at a level where they should be. The OECD Programme for International Student Assessment (PISA) 12 is the basis for the ET 2020 benchmark on underachievement of 15-year-olds in basic skills. 13 This benchmark, which aims to increase equity in education, 14 states that the share of 15-year-olds who are low achievers in reading, maths or science should be less than 15 % in the EU by 2020. In the PISA 2015 results, very few Member States have met the 2020 benchmark: 4 in reading, 3 in maths and 2 in science. But most importantly, the EU as a whole is seriously lagging behind in all three domains and has taken a step backward, compared to the PISA 2012 results (science: 20.6 %, +4.0 percentage points; reading: 19.7 %, +1.9 percentage points; maths: 22.2 %, + 0.1 percentage point). Low achievers cannot successfully complete basic tasks that are required in modern societies and the consequences of this underachievement, if it is not tackled successfully, will be eminent and costly in the long run for them individually, but also for societies as a whole. In many countries, schools tend to reproduce existing patterns of socio-economic advantage, rather than contribute to a more equitable distribution of learning opportunities and outcomes. Socio-economic status continues to be a strongly influential factor for 15-year-old students’ achievement in science, with much higher shares of low achievers among the lower social groups than among students of higher socio-economic status. 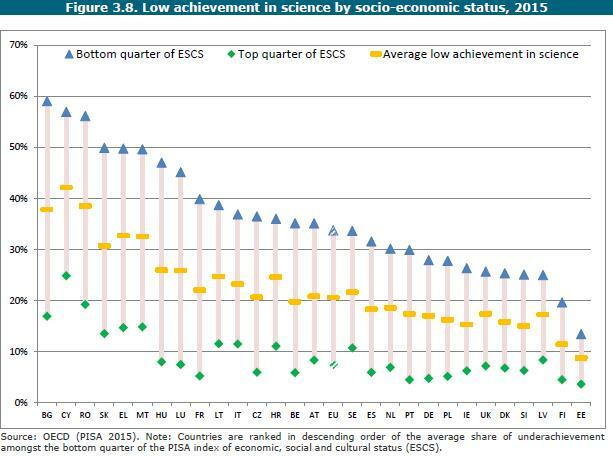 The figure below shows the share of low achievers in science in PISA 2015 in the bottom quarter of PISA’s socio-economic index and the share of low achievers in science among the upper 25 % of this index; thus, this comparison includes half of the student population that took part in PISA 2015 and is not just a comparison of extremes. Also, the gap among the upper and lower social quarters is very different across EU Member States: while it is 26.2 percentage points in the EU average, it is especially large in BG (42.1 percentage points) and above 35 percentage points in LU, HU, RO, SK and EL. There are, however, countries that are able to combine both low levels of low achievement with a low level of reproduction of socio-economic patterns. A student’s migrant background is an additional factor that is related to high shares of low achievers in most EU Member States. Even after taking into account the effects of socio-economic background, too many students with a migrant background do not achieve the necessary basic skills, and a gap remains among children of migrants who were born in the country where the test was taken. In almost all of the Member States shown here with relevant shares of migrants among their student population, the difference in the share of low achievers between migrant students and their non-migrant counterparts is quite large. 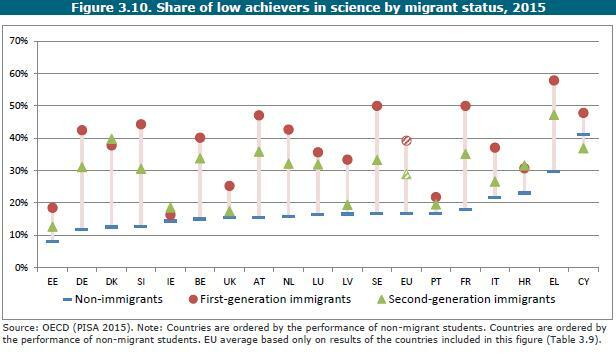 In most EU Member States with more than 3 % second generation migrant students, the share of low achievers among second generation students is lower than among first-generation students, except in DK, IE and HR but a gap remains between second generation migrants and students without a migrant background. Even if feeling like a citizen of the European Union is not similar to sharing EU values, it can however be considered as an indicator. 66 % of respondents feel they are citizens of the European Union. 15 The proportion of respondents reporting this feeling is declining in some Member States and in some Member States not feeling a citizen of the EU is quite high: 45 % of respondents in the UK say they do not feel citizens of the EU, a figure that is higher still in Cyprus, Bulgaria, Italy and Greece. More importantly and reflecting the contribution of education, a clear majority of respondents who studied up to the age of 20 or beyond feel like EU citizens (76 % versus 23 %), while those who left school at the age of 15 or earlier are evenly divided (49 % versus 49 %). The ‘sense of belonging’ as used in the PISA 2015 data is defined as feeling accepted and liked by the rest of the group, feeling connected to others and feeling like a member of a community. In school, a sense of belonging gives students feelings of security, identity and community, which, in turn, support academic, psychological and social development. The majority of students in the PISA 2015 survey feel that they belong to the school community. Advantaged students tend to feel more socially connected at school than disadvantaged students. On average across OECD countries, disadvantaged students were 7.7 percentage points less likely than advantaged students to report that they feel that they belong at school. In the table below, students’ responses to these questions were used to construct the index of sense of belonging. Positive values on this scale mean that the student has a greater sense of belonging than an average student in OECD countries. Migrant students are less likely than students without a migrant background to feel a sense of belonging at school. In Latvia, Luxembourg, Spain, and Sweden (for EU countries), migrant students reported the greatest sense of alienation from schools compared to students without a migrant background. Second-generation students expressed a stronger sense of belonging at school than migrant students, particularly in Austria, Spain and Sweden for EU countries (Table III.7.6). 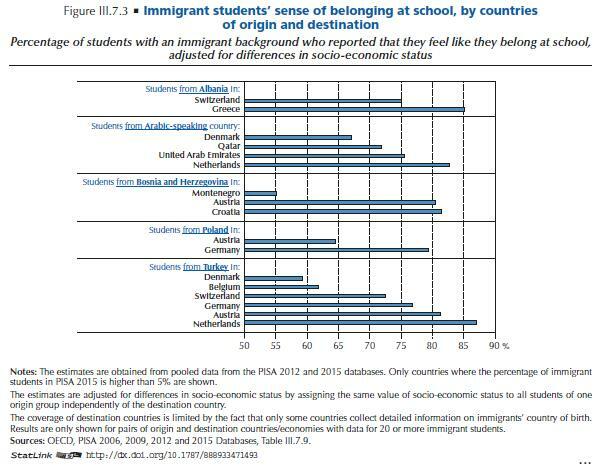 Figure III.7.3 shows the percentage of migrant students who reported that they feel that they belong at school, by country of origin and country of destination, taking into account differences in the socio-economic status of students from the same country of origin who settled in various countries. Around 83 % of students who were born in, or whose parents were born in, Arabic-speaking countries and who settled in the Netherlands reported feeling that they belong at school, but only 67 % of students from Arabic-speaking countries who settled in Denmark reported the same. These results suggest that schools and communities have an important role in supporting students to integrate and in improving their well-being. Providing dedicated support to migrant students to help them integrate into their new school community can strengthen the overall performance of education systems; this is especially relevant for those countries that recently saw a surge in migrant inflows. 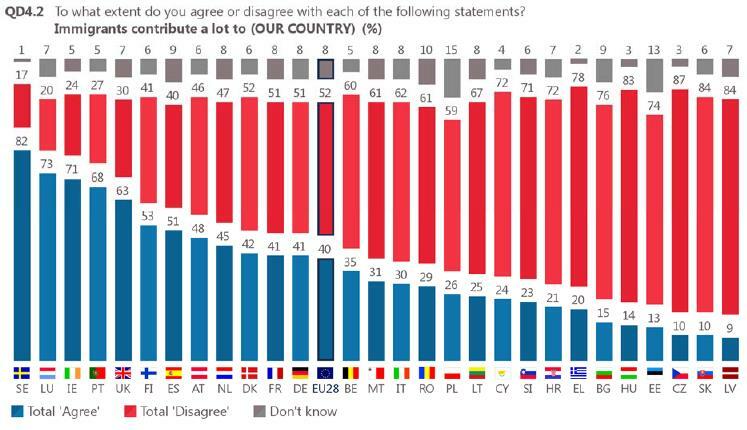 The fact that more than half of Europeans disagree that ‘migrants contribute a lot to (OUR COUNTRY)’ (52 % total ‘disagree‘, +2), with great variations between Member States 16 makes it even harder for migrants students. This results in perceptions of globalisation as a threat, and to potential for a lack of social cohesion between communities. In contrast, 8th grade students interviewed in the 2016 ICCS study expressed more tolerant opinions. 93 % of them agreed that migrant children should have the same opportunities for education as other children. 88 % agreed that migrants should enjoy the same rights as everyone else in the country. Educational approaches that build on these tolerant attitudes have potential to contribute to sustaining greater openness among adults later in life. This question from the Eurobarometer echoes in the general public the figures on the sense of belonging among students presented earlier. Across the EU more than half of respondents agree that people in (OUR COUNTRY) have many things in common. 17 Agreement is highest in Ireland (92 %) and Sweden (90 %) and lowest in Luxembourg (58 %) and France (59 %), the only two countries where it is below 60 %. Since autumn 2015, the belief that people have a lot in common in the respondent’s country has declined in 19 Member States, most noticeably in Belgium (62 %, -13 percentage points). A 2017 Eurobarometer study 18 highlighted that education and training is one of the areas in which EU citizens think the EU should take action to encourage young people to express solidarity (68%). Furthermore, a large majority of respondents (89%) agree that national governments should strengthen school education about rights and responsibilities as EU citizens. For 83%, learning about European matters should be part of compulsory school education. The IEA International Civic and Citizenship Survey 2016 19 , in which 14 Member States participated, offers a unique opportunity to investigate students’ civic knowledge and attitudes as well as the role of the educational systems in promoting educational outcomes related to civic and citizenship competences. ICCS collected data from 13-14 year old students, their teachers and schools. It reports on student achievement using a test of conceptual knowledge and understanding of civics and citizenship. It collects data about students’ values, beliefs, attitudes, behaviours and behavioural intentions related to civics and citizenship. Students’ perception of the importance of citizenship is based on 6 Likert-type items that rank the importance students give to certain behaviours in order to be a good adult citizen, including: (1) Voting in every national election; (2) Joining a political party; (3) Learning about the country’s history; (4) Following political issues in the newspaper, on the radio, on TV, or on the internet; (5) Showing respect for government representatives; and (6) Engaging in political discussions. The answers range from ‘Very important’, ‘Quite important’, ‘Not very important’ to ‘Not important at all’. Only four countries, Croatia, Italy, Lithuania and Latvia, have students with above average perception of the importance of conventional citizenship. Institutional trust reflects students’ feelings of trust in a variety of state and civic institutions in society, and relates mainly to civic society and systems. The institutions listed in the questionnaire include (1) the national government of the country; (2) the local government of the own town or city; (3) courts of justice; (4) the police; (5) political parties; and (6) the national parliament. Likert-scales were used and students were asked to indicate whether they ‘completely trust’, trust ‘quite a lot’, ‘a little’ or ‘not at all’ these institutions. 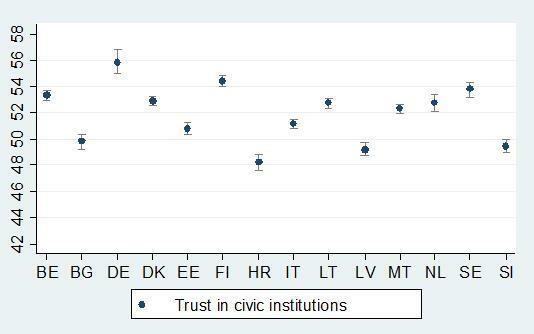 Students in most countries indicate above average trust in civic institutions in general. The exceptions are Croatia, Latvia and Slovenia. The scale for measuring students’ expected electoral participation was based on 3 Likert-type items (4 response categories: ‘I would certainly do this’, ‘I would probably do this’, ‘I would probably not do this’, and ‘I would certainly not do this’) about their future intentions of: (1) voting in local elections; (2) voting in national elections and (3) getting information about candidates before voting in an election. Students in 6 countries indicate above average intentions to participate in future elections, namely DK, FI, HR, IT, LT and SE, with BG, LV, MT and SI on average. In 2016, the Commission initiated a broad consultation process to support the proposal for a Recommendation on common values through education, training and non-formal learning. A series of dedicated consultation meetings at different political levels as well as expert seminars have been held. A dedicated ET 2020 Working Group 20 was launched in February 2016 specifically on that issue and has reported to the High-Level Group on Education and Training, a Group composed of Member States policymakers. DG Higher Education and DG Schools have also been consulted. High level reporting on the implementation of the Paris Declaration and policy debates took place at the Council meetings in February 2016, May 2016 and February 2017. Large-scale events, where input from stakeholders have been gathered include a Jean Monnet conference, a Colloquium hosted by Vice President Timmermans on ‘Tolerance and respect: preventing and combating anti-Semitic and anti-Muslim hatred in Europe’, a Colloquium hosted by Commissioner Navracsics on Promoting Inclusion and Fundamental Values through Education, the European Education Training and Youth Forum (ETY) and dedicated meeting with Civil Society. Finally a public online consultation was held from May to August 2017. The main findings of this process were that respondents felt unanimously that inclusive education which addresses the needs of all learners should be promoted, while only 16 % feel that education is currently achieving this; and revealed virtually unanimous agreement (95 %) that education should help young people ‘understand the importance of and adhere to shared values’ and that the EU should help Member States in this task (98 %). The consultation was launched on 19 May 2017 and was open until 11 August 2017. In total, 1 124 responses were received from respondents all over Europe and beyond, submitted by respondents replying in either an individual capacity (866), and on behalf of an organisation (258). 203 respondents also included position papers. Data on the background and main area of activity indicated that a majority of respondents were working in education and almost half of the respondents as teachers and trainers. In terms of geographical balance, responses were received from individuals and organisations across Europe and beyond. Most responses by far came from Mediterranean countries: in particular, Spain (294), Italy (156) and Portugal (123). They were followed by a high number of respondents from West European countries: in particular Germany (93), France (78). A good response rate was also received for Belgium (36), South-Eastern European countries [in particular: Greece (59) and Romania (34)], the UK and Ireland (35). Responses were also received from Nordic Countries (21), Candidate Countries (36) and Other Countries (23). The consultation showed strong support for the proposal. More than 90 % of respondents acknowledged the importance of education in helping young people understand and adhere to shared values. In addition, the vast majority (97.8 %) of survey respondents felt that the EU should support Member States in that goal. Early childhood education and care (ECEC) (75.6 %), primary (77.6 %) and secondary education (73.6 %) are seen as quite effective to transmit shared values. Higher education (69.9 %), vocational education and training (68 %) and adult learning (66.5 %) are seen as less effective. Overall 40.1 % of respondents consider there is some form of discrimination against learners in education and training institutions. This is particularly true for discrimination based on learners’ socio-economic background, disability and sexual orientation. When asked to indicate whether education should offer support to all learners according to their needs, respondents almost unanimously (98.6 % overall) replied this should be the case. However, only 16.6 % of respondents observed that the support is currently being provided. When asked about the most effective policy approaches when it came to teaching and learning content, respondents put forward citizenship education (81.8 %), curricula that focus on different cultures, religions and beliefs (81.5 %), intercultural understanding through arts and culture (81.4 %) and curricula to enhance knowledge and understanding of shared values (80.5 %). 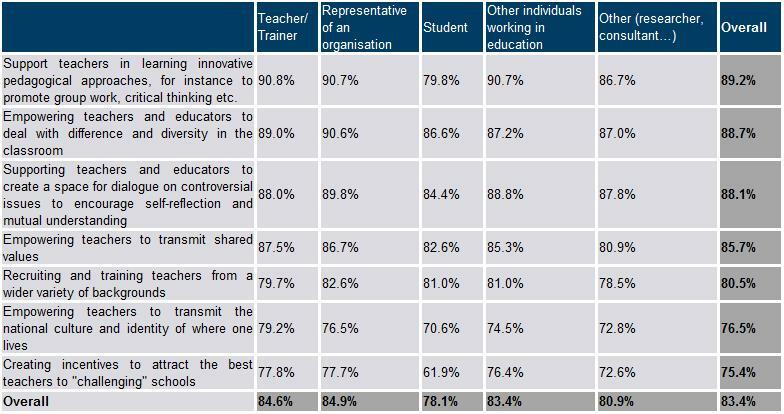 When asked about the most effective policy approaches when it came to empower and support teachers, respondents put forward a focus on innovative pedagogical approaches (89.2 %), dealing with diversity (88.7 %), open classroom climate (88.1 %), transmitting shared values (85.7 %), recruiting teachers from diverse backgrounds (80.5 %). When asked about the most effective policy approaches when it came to create inclusive learning environments, respondents put forward creating opportunities for civic engagement and volunteering (87.3 %), participation in extracurricular activities (86.6 %), democratic learning environments (86.6 %), participation in cultural activities (85.9 %). -Empowering and strengthening the role of teachers (e.g. initial teacher training (ITE) and continuing professional development (CPD) so they are able to teach about citizenship, human rights, the functioning of the European Union and the values highlighted in the Lisbon Treaty and lead open discussions with pupils on sensitive and topics such as radicalisation, social exclusion and discrimination and other challenging teaching tasks related to dealing with diversity in the classroom. -Adapted school curricula which focus on the transversal issues of citizenship, democratisation and human rights, and that take into account the needs of individual learners, teacher expertise and local specificities. Diverse, innovative and learner-centred teaching methods should be used to develop key competences and citizenship — using the Key Competences Framework as a guiding tool. -Supporting disadvantaged learners by providing mentoring and peer guidance as a way of preventing early school leaving and social exclusion. Several papers also mentioned the importance of providing financial support to migrant and refugee students, ensuring a mix in classrooms of students from different backgrounds and cultures to avoid segregation and foster inclusiveness, and recognition of prior learning, especially with reference to skills, competences and knowledge gained abroad or in different (often non-formal) learning settings. -Relying on non-formal learning with actors in the field of non-formal learning trained and made aware of their role in promoting shared values; and likewise, teachers inside formal education and training should encourage the participation in extracurricular activities as a way of bridging and increasing cooperation between formal and non-formal education providers. -Importance of involving the wider community in the promotion of EU values and social inclusion. Parents, families, local authorities, social services and third sector organisations should be involved to support the development of ‘whole-school’ approaches for creating democratic environments where cooperation among all community actors takes place and people learn to live together in mutual respect for each other’s culture, language, religion, gender, sexual orientation and expression. -Respondents support citizenship education, curricula that focus on different cultures, religions and beliefs, intercultural understanding through arts and culture and curricula to enhance knowledge and understanding of common values and to create a democratic learning environment with opportunities for civic engagement and volunteering as a key objective. -Respondents are very supportive of targeted actions towards disadvantaged learners. -Respondents are very supportive of initiatives that would increase understanding of the European Union. -Respondents support the need to empower teachers to develop innovative pedagogical approaches, to be able to deal with diversity (88.7 %), and they support an open classroom climate. Education institutions are seen as among the most significant socialising factors for students to become well-informed, socially integrated, active and responsible young individuals capable of contributing to the well-being of the society in which they live. It is also acknowledged that students’ civic knowledge and civic engagement is linked with individual’s characteristics and activities outside the school (family, peers, local community and, recently, social media). The results from the ICCS survey show that although more than half of the explained variance for non-cognitive civic outcomes is attributable to individual characteristics, school characteristics and policies can make an impact. School characteristics have a moderate impact in particular on students’ trust in civic institutions as well as on their perception of equal rights for migrants. In-school practices (participatory governance, student councils, etc.) contribute to the variance explained in students’ expected electoral participation, their perception of the importance of personal responsibility for citizenship and their perception of the importance of active forms of citizenship such as participating in peaceful protests or engaging in environmental protection. 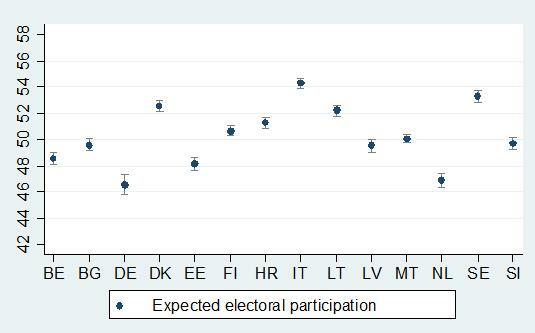 In some countries, in-school practices explain a much bigger share of the variance on expected electoral participation, as for instance in the Netherlands. However, civic and citizenship knowledge together with civic self-efficacy (e.g. one’s perceived ability and self-confidence in promoting one’s views on civic issues) remain more important predictors of the students’ civic attitudes, behavioural intentions and openness for diversity (e.g. non-cognitive outcomes), than the pure educational factors. Civic self-efficacy is consistently positively related to all the eight non-cognitive outcomes across all the countries. Civic knowledge is positively related to the students’ attitudes on the importance of active forms for citizenship, to their feeling of personal responsibility for citizenship issues, to their intentions for future electoral participation and to their positive attitudes towards ethnic minorities and migrants. From this rather complex argument a picture emerges: Any education system that aims to improve students’ civic attitudes needs to foster students’ formal civic and citizenship knowledge and their civic self-efficacy. Both efficacy and knowledge remain influential on students’ civic attitudes after taking into account a wide range of school and educational factors. These two individual characteristics seem to be crucial to foster positive civic attitudes. -Informal learning outside the learning environment, for instance through unpaid service activities for the wider community, can also have a positive impact. The chapter below sets out a selection of thematic approaches through which education policies and practices can help to support social cohesion and create a sense of belonging. Each theme is presented in three main sections, covering the state of play, an explanation of the content and scope of the theme, and suggestions with regard to its implementation, including national case studies. The first approach is to promote common values. In democratic societies citizenship education supports students in becoming active, informed and responsible citizens. The aim is not to create parallel societies but make young people able to take responsibility for themselves and help them to develop a sense of belonging and prevent feelings of rejection and alienation from society. Despite various policies developed and adopted at the EU and national levels, indicators of intolerance, discrimination and racism have not shown any significant decrease across Europe in recent decades (see also chapter 2). According to the ICCS survey, formal learning impacts positively on several non-cognitive outcomes in the 14 participating EU Member States. 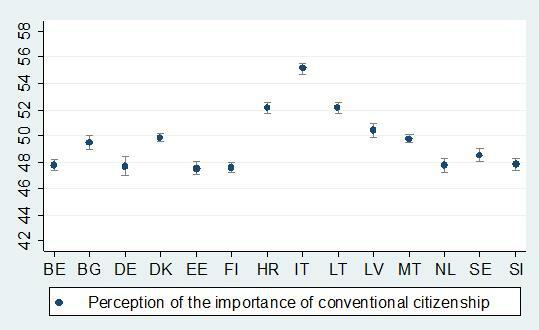 In seven Member States formal learning of civic issues is associated with attitudes towards conventional citizenship (BG, DK, HR, IT, MT, NL and SI). Formal learning is associated with trust in civic institutions in BG, DK, FI, HR, MT and SE, and associated with intentions of future electoral participation in BE, DK, SE and SI. However, the knowledge, skills and attitudes a student needs to become an active citizen is not only something that can be taught in school. The lived experience, both inside the learning environment and outside, tends to be one of the most powerful influences on young people’s attitudes towards citizenship. Learning to be an active citizen within the school environment is an important factor in the equation, alongside the influences of family, peers and neighbourhood. Values cannot be successfully conveyed in the classroom by ‘preaching’ what students should think; if a student does not feel that values which are preached correspond to his/her own values, this can lead to a blockage and a rejection of the set of values being promoted and potentially — on a wider level — lead to a disconnect with society. A range of classroom and teaching practices can more effectively promote and convey core values including exercises, role plays, debates and methods to deconstruct negative values or stereotypes. The rise of populism and extremisms in particular generates a need to learn how to address controversial issues in the classroom. ‘Containment’ (not addressing these issues for fear of opening Pandora’s Box) is harmful as extreme opinions are left unaddressed and those holding minority opinions can feel marginalised, which can impair confidence and sometimes leading to more extreme behaviours. Learners need to be given opportunities or platforms to discuss, in an appropriate manner, sensitive and ‘burning bridge’ issues that divide communities, weigh on children and encourage simplistic views of the world and others. By creating safe spaces for constructive dialogue, where learners experience non-conflictual discussions on controversial topics, education systems help learners develop a personal understanding of complex issues and question their own assumptions and those of others. Education is also a means to combat polarisation and equip learners with the tools to deal with increasing volumes of information, be aware of risks related to the reliability of the information sources, help distinguish fact from fiction, and exercise sound judgment. Such media literacy and critical thinking contribute to active and responsible citizenship, employability and personal development. The advent of the internet and information technology is creating a revolution in the lives of young people and also in education. It provides both opportunities and threats. According to a recent study, some 90 % of EU households have access to the internet, 22 which allows students to access information almost without boundaries. At the same time, research is increasingly showing that the internet and social media can promote intolerant acts and cause psychological harm. Cyberbullying is a real danger to young people in today’s classrooms, as is exposure to extremist ideas and hate speech. Furthermore, extremist groups benefit from the opportunities they get on the internet and through social media to influence young people and recruit new members, as well as reinforce divisions and existing prejudices. The concept of digital citizenship encompasses a range of competences, attributes and behaviours that harness the benefits and opportunities the online world affords while building resilience to potential harm. Council Conclusion on inclusion in diversity to achieve a high quality education for all from 2017, in which Member States and the Commission agreed to put measures in place to promote a democratic and inclusive school culture, develop measures that allow the early identification and prevention of social exclusion and encourage closer cooperation between education and other relevant areas, such as culture, youth, sports, employment, welfare, security and other channels of work on social inclusion. Council Conclusion on the role of youth work in supporting young people's development from 2017, in which Member States and the Commission agreed to strengthen the cooperation, peer learning and exchange with regard to the promotion and development of life skills among young people. Recommendation 2006/962/EC of the European Parliament and of the Council of 18 December 2006 on key competences for lifelong learning 24 identifies the knowledge, skills and attitudes for personal fulfilment, active citizenship, social cohesion and employability. The Council Conclusions of 25 November 2014 on a Work Plan for Culture 2015-2018 prioritises EU policy collaboration on the contribution of culture to social inclusion, building on the commitments to cultural diversity and intercultural dialogue in the European Agenda for Culture. A comprehensive survey on Citizenship Education at School in Europe has been carried out by Eurydice and published in October 2017 25 . The report shows that all countries have ambitious curricula to develop a number of competences related to interacting effectively and constructively with others, acting in a socially responsible manner, acting democratically and thinking critically. The report also documents that citizenship education appears to be an issue, which is currently in the spotlight in a number of countries across Europe. Countries have increased the number of teaching hours, the curricula have been revised, teacher initial and professional training have been upgraded and improved guidance and support material is more widely available. 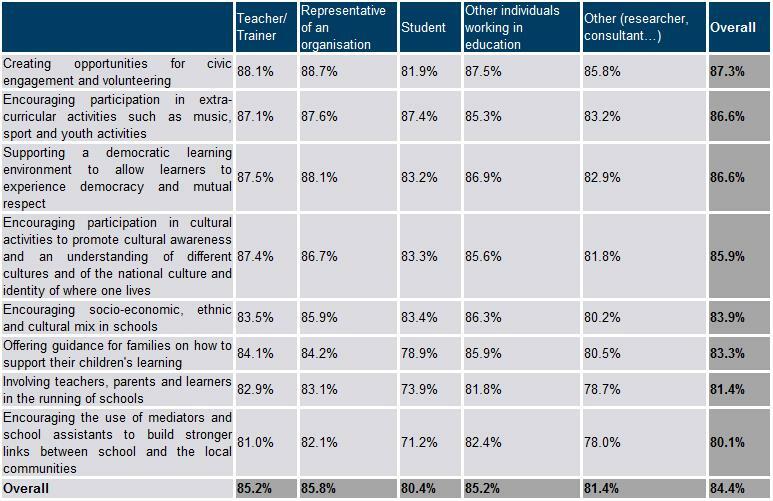 Furthermore, despite progress in recent years, nearly half of the countries surveyed in the Eurydice study on civic education still have no regulations or recommendations on the development of prospective teachers’ citizenship education competences through initial teacher education Furthermore, although the majority of education authorities organise or support opportunities for teachers’ continuing professional development in this area of learning, similar opportunities for school heads are rather limited. In almost half of education systems, there are no central level regulations or recommendations on suitable methods for classroom assessment in this area of learning. Council Conclusions on developing media literacy and critical thinking through education and training It is one of the four pillars of the Paris Declaration to strengthen ‘children’s and young people’s ability to think critically and exercise judgment so that, particularly in the context of the Internet and social media, they are able to grasp realities, to distinguish fact from opinion, to recognise propaganda and to resist all forms of indoctrination and hate speech’. The November 2017 Council conclusions on Smart Youth Work 26 focus on how youth work can help young people fully benefit from recent technological developments. The European Solidarity Corps 27 is a new European Union initiative which creates opportunities for young people to volunteer or work in projects in their own country or abroad that benefit communities and people around Europe. Horizon 2020 will support in 2018 research projects on the inclusion of children in migration within EU education systems (Societal Challenge 6, Work Programme 2018-20). -developing comprehensive national/regional strategies and effective implementation tools underpinned by the necessary resources. 83 Austrian schools are members of the UNESCO Associated Schools Project Network (ASPNet), including the school houseboat Bertha von Suttner, which aim to promote learning as an activity-focused process, pursuing an interdisciplinary, intercultural approach to cooperation, applying an integrative style of education with diversity as a key component in its pedagogy and practising democracy is a pre-eminent educational goal. To encourage more critical thinking — particularly in relation to messages that may be propagated by (social) media networks — and address more complex issues, schools in Belgium have been given access to networks of experts. One such network is a network of Experts on Islam. The network (which is in operation since 1 October 2015) consists of experienced experts on Islam (volunteers with exception of the coordinator) who have a thorough knowledge of Islamic theology and who are at the same time familiar with the world and the experience of young people. The goal of the network is to frame and interpret Islam and Islamic norms and values for youth, class groups and/or frontline workers (e.g. teachers, youth workers). The network has three goals: (1) Give frontline workers and teachers the confidence and knowledge to address Muslim students and/or their parents; (2) On demand of schools, the network can carry out preventive work by addressing school groups, guiding class discussions and facilitate dialogue between different life views and beliefs; (3) The network can also help if teachers or frontline workers suspect radicalisation or are confronted with an escalating situation. During these interventions, educational opportunities are provided for students, class groups, frontline workers, teachers and, on demand, parents. From 2017 in Denmark, the Ministry for Children, Education and Gender Equality has provided tailored guidance to schools by hiring learning consultants, who support schools and municipalities in promoting democracy and citizenship and in preventing radicalisation and extremism at school. Finland provides general guidelines with the national core curriculum but indicates a number of national and international resources organisations where support materials are available, including UNICEF and Council of Europe. UNICEF runs a well-established programme of global citizenship education linked to the Sustainable Development Goals, with a focus on the areas of global advocacy and policy dialogue, global measurements of progress, peace and human rights education, preventing violent extremism through education and education about the Holocaust. In Finland, student councils are set up at every educational level. Learners can for example make decisions about what to do with funding or how to manage school public spaces. The Project to Support Student Councils in Finnish Comprehensive Schools (SPOT) started in June 2014 and is a cooperative project to support student councils in promoting a communal working culture at schools. The project has collected methods supporting participation and student councils’ work, and has also planned methods, processes and practices on how to promote a participatory and communicative culture at schools which are appropriate for different age groups of children. A web-based service offering tools and material support for teachers responsible for student councils was launched in January 2015. In France, the Loi 2013 pour la refondation de l’école de la République outlines a new programme of civic education, demonstrating a renewed emphasis on citizenship education within the new academic pathway of all students through a ‘Citizenship Journey’ [Parcours Citoyen]. Addressing regions, schools, teachers and curriculum, this is supported by a broad selection of guidance and resources hosted on the national Eduscol website. The ‘réserve citoyenne’ initiative, launched by the French Ministry of Education in 2015, offers the opportunity to all citizens and all actors from civic society to volunteer alongside teachers in extra-curricular activities to promote republican values in schools. Each spring, teachers of all levels of education and in all disciplines are invited to participate in the Press and Media Week at School (Semaine de la presse et des médias dans l’école). The week involves over three million students and over 200 000 teachers. The aim of the week is to help young people of all ages to understand the media system, to develop their critical thinking, to develop a taste for current affairs and to forge their identity as a citizen. Each year, some 1 900 media organisations sign up to the event, which is organised by CLEMI (Centre for Liaison between Education and Media), part of the Ministry of Education. CLEMI proves a series of teaching resources every year including: a pedagogical kit, a tablet application on media education, exhibitions, six interactive games, events, publications and workshops. This year (2016), the 27th edition of the week, will be devoted to freedom of expression, deliberately chosen in the wake of the terrorist attacks. Mira Media is an independent cooperative body founded in 1986 by the major national migrant organisations in the Netherlands, which aims to achieve more diversity and ‘ethnic’ pluralism by supporting the participation of migrants in radio, television and the interactive media. Mira means looking in different languages, mirror and reflection. The name stands for the efforts of the organisation to ensure that the media in the Netherlands are a good reflection of society. Mira Media has no broadcasting time but closely cooperates with Dutch national and local (public and commercial) broadcasters. Mira Media uses media as a tool for intercultural dialogue and social cohesion at the neighbourhood level and encourages citizens to engage in active media participation. It works with many partners in the social field and in the media in order to achieve comprehensive and sustainable programmes. Mira Media also focuses on improving digital literacy and media educational support to vulnerable groups such as older people and (migrant) parents. The Swedish Media Council is a government agency whose primary task is to promote the empowering of minors as conscious media users and to protect them from harmful media influences. The Media Council gathers relevant research and disseminates information on media development, media effects and media use regarding children and young people. The Council also classifies films for public screening. The ratings reflect whether the films are liable to harm the well-being of children. The Swedish Media Council operates the Swedish Safer Internet Centre for a safer use of the Internet and other digital media among children and young people, and represents Sweden in the pan-European network Insafe. The project is run in collaboration with BRIS (Children’s rights in Society) and is co-funded by the European Commission’s Connecting Europe Facility. The European Union Agency for Fundamental Rights argues in its 2017 report 33 on segregation of migrants that possible solutions to such segregationist tendencies can be to distribute migrant children to different schools and to reach out more to migrant parents to empower them. In such cases, migrant parents are supported in becoming more involved in the schools their children attend. The report identified systematic policy efforts to reach out and engage with migrant parents in only 4 of the 14 member states covered in the report. 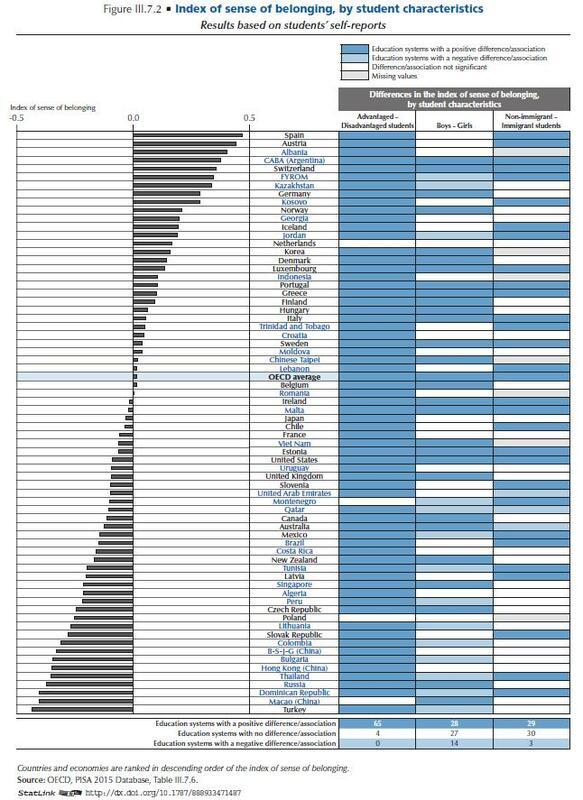 34 Only 12 Member States have adopted legislation prohibiting discrimination on the grounds of nationality or migrant, or foreigner status, according to this report. The Council recommendation on effective Roma integration measures in the Member States (2013) 35 specifically recommends the Member States under point 1.3 on ‘Access to education’ to take effective measures to ensure equal treatment and full access for Roma boys and girls to equality and mainstream education by such measures as ‘a) eliminating any school segregation’ and ‘b) putting an end to any inappropriate placement of Roma pupils in special needs schools’. -removing structural barriers and dead ends between various educational levels and sectors in the education system, facilitating flexible learning pathways and providing adequate guidance on educational and career choices, particularly through financial and mentoring support to disadvantaged learners. For children with special needs, the entry into force in 2015/2016 of the ‘M-decree’ in Belgium (Flanders) is a major step towards increasing inclusion in the mainstream system. From September 2015, every child, including those with special needs, has the right to enrol in a mainstream school, provided this is possible with reasonable adaptations. Around 180 full-time staff specialising in special education provide support to teacher teams in regular education (Crevits 2015a). Initial results show a greater proportion of students with special needs participating in mainstream rather than special education. In Ireland a new DEIS (Delivering Equality of Opportunity in Schools) scheme, will draw on international best practice for using the education system to increase opportunities and outcomes for children from disadvantaged backgrounds. In January 2016 the Minister for Education and Skills launched a new consultative forum on developing an updated literacy and numeracy strategy for the period up to 2020. The review outcomes support further emphasis on tackling disadvantage for students for whom English is a foreign language and other groups. In Sweden, asylum-seeking children must join school within one month of arrival, and their previous schooling and academic knowledge are assessed within two months. Special introductory classes for newly arrived children are limited to two years, and students also have a place in mainstream classes, where they can take part in accordance with their proficiency in different subjects. Swedish teaching is combined with teaching in mother tongue. Education providers receive increased financial support in neighbourhoods with large migrant populations. This approach concerns encouraging a deeper knowledge and understanding about the origins and funtioning of the EU; diversity and cultural identities in Europe, the main developments in national, European and world history; the multi-cultural and socio-economic dimensions of European societies, and how having a national cultural identity is compatible with a European identity. Fostering understanding that a national or regional cultural identity is compatible with a European identity could help young people develop a sense of belonging to the European Union as well as to one’s locality and country. The Union has a significant effect on the lives of all Europeans, and to fully benefit from and participate in the democratic construction of the European Union knowledge of it and clear understanding of how it has developed is needed. Education has a major role to play. Within the framework of the Erasmus+, numerous projects have been financed in relation to EU facts and knowledge, particularly in the context of the Jean Monnet strand of the programme. The ‘Europe for Citizens Programme’ through its strand 1 "European remembrance" and strand 2 "Civic participation and democratic engagement" has provided support to several projects dealing with European integration; in some cases concerning the primary and secondary education sector. Every year, the Commission organises information on the European Union at school level and its Directorate General for Communication has established a network of school correspondents in all Commission Representations in the Member States. They inform teachers and pupils and promote repositories such as: the ‘Teachers Corner’ 39 where material on the EU is made available. The Directorate General for Education and Culture has designed and implemented a specific action in the framework of the Jean Monnet activities named ‘Learning EU at School’. A study collected information and data at the level of the Member States on the state of the art in the European countries’ legislations, rules and practices on the way EU is taught at school and was followed by an EU conference. An annual call for proposals supports projects for developing teaching of EU in general education and in VET. In spite of the effort done the general level of knowledge of the European Union, its policies and its institutions remains less than optimal, with a large part of the population having little or no knowledge or information on the Union. This is particularly valid for young people and it is reflected in the lowest turn-out rate (42.5 %) at the 2014 EP elections. More than 70 % of young people did not vote. Young people are also the age group which feel strongest that more information about the EU institutions is needed. The knowledge deficit includes a basic lack of understanding of the European Union itself, with only 20 % of adults being able to answer correctly simple questions on the Union (e.g. number of Member States, functioning of the presidency, and elections of the EP). -visits outside of the school or youth organisation. - Innovating in resources and methods, towards a more collaborative way of society building. During 12 months, UTAD will go inside secondary schools, bringing knowledge and an interdisciplinary team committed to guiding teachers and pupils in the route of participation in Europe’s history. This approach concerns supporting teachers to deal with diversity and create an open classroom climate, in recognition of the fact that the teacher’s role goes beyond transmitting knowledge and includes communicating common values and acting as role models themselves. Teachers need to take up these issues, and be supported. However, teachers do not feel empowered to deal with diversity and make change happen. Too often, only certain specialists are trained in inclusive principles, while all teachers would need to know how to integrate the principles of inclusive education into teaching practices. There is also considerable burn-out among teachers across the EU and too many leave the profession prematurely. This is especially the case in schools in traditionally underserved communities. Democratic leadership should be promoted at all levels of the school, viewing teachers and other staff as facilitators of student learning instead of carriers of all knowledge. Teachers need ongoing support when taking on new roles in the classroom and school. A sense of belonging can be improved through a dedicated emphasis, constant promotion of parental and student involvement and quality of the teacher-student relationship. According to the ICCS survey, an open classroom climate stands out as having the most consistent positive relationship with students’ civic attitudes across all the various education factors. Students who experience an open classroom climate where they feel they can express their opinions, ask questions and contrast different opinions are more ready to accept various citizenship values, trust democratic institutions and anticipate they will vote later. Students’ participation in school has a more specific function in fostering expected later participation. Council Conclusions on inclusion in diversity to achieve a high quality education for all develop measures that allow the early identification and prevention of social exclusion and encourage closer cooperation between education and other relevant areas, such as culture, youth, sports, employment, welfare, security and other channels of work on social inclusion. The Radicalisation Awareness Network 40 has introduced two guidance documents to empower and support teachers and to equip them with pedagogical tools to handle discussions with students on perceived injustice, radical ideas and even extreme opinions. The idea behind the guide is that schools should provide a safe place, allow students to engage with developments in society guided by trained teachers, and prepare young people to be democratic citizens. -Promoting diversity within the teaching profession itself, through fostering the recruitment and career development of teachers from migrant and/or minority backgrounds, can facilitate a greater awareness of global citizenship among students, other teachers and the wider school environment (e.g. parents, governors, partners, local decision-makers), and make teachers aware of their own (potential) subtle biases and how these can impact students. The Alpen-Adria Universität14 in Klagenfurt provides a three-year Masters programme in GCED which trains specialists in GCED who can serve as resource and multipliers for other teachers and educators, as well as schools. (1) State of the Union Speech, 19 September, 2017 — https://ec.europa.eu/commission/state-union-2017_en . (2) Paris Declaration, 17th March, 2017 - http://ec.europa.eu/education/news/20150316-paris-education_en . (3) Reflection paper on harnessing globalisation, 10th May, 2017 - https://ec.europa.eu/commission/publications/reflection-paper-harnessing-globalisation_en . (5) Commission Communication of 30 May 2017 on School Development and Excellent Teaching for a Great Start in Life; COM(2017) 248. (6) Commission Communication of 30 May 2017 on a Renewed Agenda for Higher Education; COM(2017) 247 . (7) Proposal for a Council Recommendation on tracking graduates; COM(2017) 249. (9) Commission Decision of 27 July 2017 setting up the High-Level Commission Expert Group on radicalisation. JO C252/3, 3.8.2017. (10) Standard Eurobarometer 87 , Data collected in May 2017. (11) Special Eurobarometer 451, Future of Europe , Data collected in autumn 2016. (13) Low achievers are students who do not reach competence level 2. (15) Standard Eurobarometer 85, European citizenship , Data collected in Spring 2016. (16) Standard Eurobarometer 85, European citizenship , Data collected in spring 2016. (17) Standard Eurobarometer 85, European citizenship , Data collected in Spring 2016. (18) Flash Eurobarometer survey FL455 European Youth. (20) See Joint Report of the Council and the Commission on the implementation of the strategic framework for European cooperation in education and training (ET 2020) New priorities for European cooperation in education and training (OJ C 417, 15.12.2015) for an explanation of the ET2020 governance structures. Eurostat (2015) http://ec.europa.eu/eurostat/statistics-explained/index.php/File:Proportion_of_households_with_access_to_computers_and_the_internet_at_home,_EU-28,_2007 %E2 %80 %9314_(%C2 %B9)_(%25)_BYIE15.png. (24) Recommendation of the European Parliament and of the Council of 18 December 2006 on key competences for lifelong learning OJ L 394, 30.12.2006, p. 10. (30) The whole-school culture and approach to citizenship education can be an important factor in successfully implementing the subject at class level and thereby have a positive impact on individual learners. Research shows that there is also a myriad of benefits at school level from a stronger community feeling and sense of belonging within the school to improved behaviour and attitudes leading to increased student engagement and motivation. The whole-school approach can also take the school into the wider community, to break down barriers and connect young people to community life. (32) United Nations, Committee on the Rights of Persons with Disabilities (2015), Concluding observations on the initial report of the European Union, CRPD/C/EU/CO/1 of 2 October 2015. .
(34) Denmark, Finland, France and Portugal. .
Council recommendation on effective Roma integration measures in the Member States, EMPLOYMENT, SOCIAL POLICY, HEALTH and CONSUMER AFFAIRS Council meeting, Brussels, 9 and 10 December 2013. (38) Council Recommendation of 28 June 2011 on policies to reduce early school leaving.